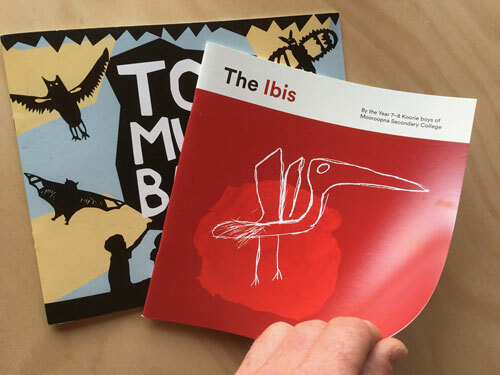 In February 2016, with support from the BB & A Miller Fund, Beecher Family Charitable Fund and Johnston Gumption Fund, Scarlet’s Fund supported the launch of The Ibis at Blak and Bright, the inaugural Victorian Indigenous Literary Festival. Created by year 7/8 Koorie boys from Mooroopna Secondary College, their school coordinator commented that it was ‘the first time that they have something significant… they are signing them and going around selling them to the teachers’. Since 2013, Kids’ Own Publishing has worked with a remote community in the Northern Territory. Too Much Bats is the latest book created by children in Wugularr, and has been published in English, with Kriol and Rittharngu, one of 20 local languages soon to follow. Scarlet’s Fund supported a volunteer to support the artist residency in April 2016. Congratulations to these young boys. How exciting for them I can see their beaming faces as they are giving their autograph to the teachers:) Well done to you K.O.P and Scarlet’s Fund so, lovely to hear about these wonderful stories.